Kahn and Horowitz were founding members of East River CORE. They were also long time allies of Bayard Rustin's and worked closely with him in organizing the March on Washington. Along with East River CORE members Penn Kemble, Paul and Sandy Feldman and Norm and Velma Hill from national CORE, they were also leading members of the Demcratic Socialists, USA (formerly the Socialist Party). 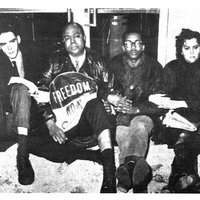 The Black male sitting on Farmer's left is Ernest Green of the Little Rock Nine. “photo of Tom Kahn and Rachelle Horowitz, East River CORE, with James Farmer,” corenyc.org, accessed April 21, 2019, http://www.corenyc.org/omeka/items/show/179.